Climate change will likely increase the frequency and/or intensity of certain extreme weather events, and perceived experience with extreme weather may influence climate change beliefs, attitudes and behaviors. We found that the public tends to accurately recall and report their experience with extreme weather events, particularly regarding events that cause severe property damage and loss of life. Also, the larger the event is in magnitude (e.g., a stronger tornado), the larger the shadow of experience becomes, sometimes stretching many miles beyond the direct impact zone. As disaster events increase in magnitude, they are more likely to cause not only direct damages and loss of life, but indirect damages through disruption of services, utilities, businesses, social networks, and local economies. However, we found that drought events are harder for people to perceive because they happen gradually over a long period of time. In fact, we found that only in areas exposed to at least 25 weeks of extreme drought conditions did the majority of people (>50%) report they had experienced a drought. Other research has found that extreme events can be teachable moments about climate change. 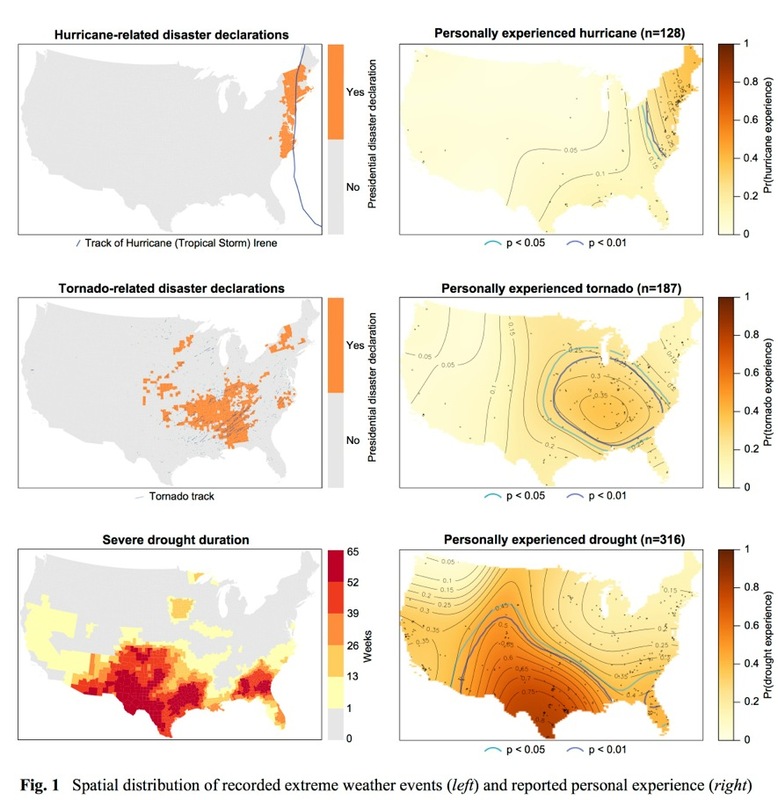 These results of this study suggest that people within an event’s shadow of experience may be particularly open and interested to learn more about disaster preparedness, climate change, and its impacts after the event has occurred. If you would like a copy of the paper, please contact us at climatechange@yale.edu with the subject line: Shadow Paper Request. Howe, P., Boudet, H. Maibach, E., and Leiserowitz, A. (2014) “Mapping the Shadow of Experience of Extreme Weather Events.” Climatic Change 127 (2): 381–89. DOI:10.1007/s10584-014-1253-6.